The House of Representatives plans to vote on several health reform bills this week, and two deserve particular attention. First, religious liberty is once again in the forefront with a bill that would allow Christian Scientists an exemption from Obamacare’s individual mandate that only the Amish and Old Order of Mennonites now receive. Christian Scientists believe in the healing power of prayer, yet they are required to purchase health insurance laden with expensive medical benefits they won’t use. The Equitable Access to Care and Health Act (HR 1814) would allow an exemption from the mandate for individuals who have sincerely held religious beliefs that conflict with Obamacare’s requirement that they purchase compliant health insurance. The EACH Act has at least 210 co-sponsors, including 75 Democrats. Any members worried about voting on legislation that would “fix” Obamacare should put those concerns aside. The bill makes an important statement about bipartisan support for religious liberty and deserves their support. Second, another bill with bipartisan support is expected to reach the House floor this week — the “doc fix.” Leading legislators from both sides of the aisle and both houses of Congress have been working since last year on legislation to replace the flawed Sustainable Growth Rate formula that calls for annual cuts in Medicare payments for physicians — cuts that would slash payments for medical services up to 30 percent. Congress overrides the cuts every year, and the current patch expires on March 31. While House and Senate committee chairmen have agreed on the structure of the doc fix, they have not agreed on how to pay for it. The House would pay for the $138 billion, eleven-year cost of the bill by repealing the individual mandate — which the Congressional Budget Office estimates would create more than twice that amount in savings to taxpayers. The president is likely to illegally delay the individual mandate anyway after the current Obamacare enrollment period ends March 31. House leaders are right to take every opportunity to legally repeal the most despised part of the health overhaul law. The Senate doesn’t agree with this fix and is looking at a number of other ways to pay for it, including expanding the impossibly complex 340B program. This program has been around since 1992 and was designed to make sure that about 90 safety-net hospitals treating indigent patients could provide prescription drugs at rock-bottom prices. But the program has grown to the point that a recent memo from the Office of Inspector General of the Health and Human Services Department says more than 10,000 medical facilities are taking advantage of the program, including one third of hospitals and community health centers. The IG report shows how extraordinarily difficult it is to make sure facilities are complying with the requirement that they dispense 340B drugs only to eligible patients. What would the measure the Senate is considering do? Expand it, of course. The Senate is considering allowing Medicare Part B to capture the discount prices in the 340B program. This would extend the discounts, originally targeted to indigent patients, to drugs delivered in Medicare Part B. Currently, the savings from these lower prices go to the covered entity — the hospital or community health center and not the U.S. Treasury. However, giving Medicare access to 340B’s deeply discounted drugs would open the floodgates. This would be nothing more than a new form of price controls for drugs. Research into new drugs would likely be dramatically affected, just as Obamacare’s tax increases are shutting off research in the U.S. medical-device industry. The House plan is the right way to go. Members should vote to repeal the individual mandate at every opportunity, including as a way to pay for the doc-fix. 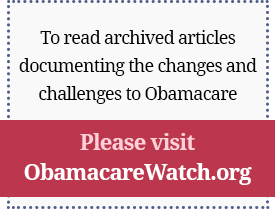 Previous Article: Varney & Co.: Is ObamaCare working the way it should?